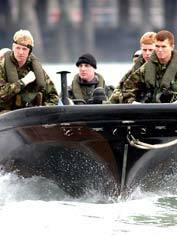 Royal Marines Commando training is the longest basic infantry training of any NATO combat troops. When recruits earn their green beret and become a Royal Marines Commando, they are joining one of the world's elite fighting forces. To reach this level of combat readiness, recruits at The Commando Training Centre Royal Marines (CTCRM) develop high levels of physical and mental toughness. Those who successfully complete the course at CTCRM will be fully prepared for operations in many different environments. The programme of training at CTCRM has been developed over many decades, and will gradually build up recruits' physical and mental abilities as well as their war-fighting skills. This avoids unnecessary injury or exposure to danger without minimising the significant challenges that the course at Lympstone poses. If recruits are injured during training they will receive world-class medical care and support, to allow them to rejoin the programme as quickly as possible. This care is delivered through Hunter Company, the rehabilitation department for the Commando Training Wing. The Company is named after Corporal Thomas Peck Hunter who was posthumously awarded the Victoria Cross after his extreme example of courage and self-sacrifice. His citation is mounted on the wall in the gymnasium (Hunter Hall). The aim of Hunter Company is to provide the specific remedial training required to enable recruits to rejoin training as quickly as possible. To achieve this rehabilitation is tailored around the injury type and specific needs, allied to this we have the best-equipped rehabilitation gym within the British Armed Forces. The remedial department consists of one Sergeant and four Corporal Physical Training Instructors who have passed an eight-month Remedial Instructors course. They are assisted by a full-time chartered physiotherapist. As well as delivering medical and physical rehabilitation there are two military training teams. These teams run varied training programmes with the aim of improving the military skills taught up to the time of injury. 1 Troop - all those recruits who are withdrawn from training for medical reasons. 2 Troop - all those recruits whose injuries have healed and are improving their fitness plus all those recruits who are withdrawn from training for not passing a physical criteria test. To progress from 1 to 2 Troop and from 2 Troop back into training you must have the approval of your Remedial Instructor and be passed fit by the Principle Medical Officer at a weekly clinic. What is required of a Recruit in Hunter Company? In short - EFFORT! Hunter Company will provide all of the support that is required to get back to training. The pace of life in Hunter Company is slightly slower than in a recruit troop for obvious reasons, but it is no less demanding in the standards of conduct and discipline. To achieve success in Hunter Company the recruits will have their Commando qualities tested to the limit, particularly cheerfulness in the face of adversity, determination and unselfishness. Success will only come through hard work, perseverance and commitment. Each Company has its own Company Commander, who is accountable to the Officer Commanding Commando Training Wing. Their job is to conduct and supervise training. They also monitor the progress of the recruits' training, organising extra tuition and remedial training for those who are encountering difficulties so that they reach the appropriate standards and complete training successfully.